There's a lot of talk in fishing media outlets (magazines, blogs, etc...) right now touting the excellent opportunity that fall trout fishing represents. I love fall fishing too; there's something about a crisp, brisk morning chill that really gets my blood flowing. It will be especially sweet this year - finally escaping the record number of 90+ degree days we suffered through this summer; heck, we might even finally get some rain. 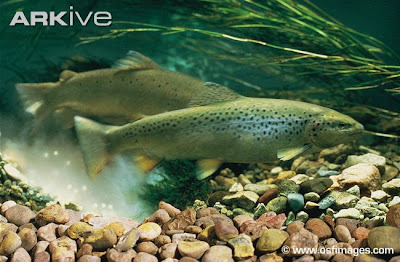 The trout waters I prefer fishing contain self-sustaining populations of wild browns. With the fall (& winter), that also means it is prime time for brown trout to do their version of bumping uglies. While I try not to wade too much while trout fishing (the water is typically small and it's residents spooky), I do make it a point to be extra careful in the fall and avoid any shallow water redds (spawning areas) that I can visibly make out. Don't want to step on that trophy brown I'm going to catch come 2014. So I guess my questions could be considered somewhat ethical in nature. 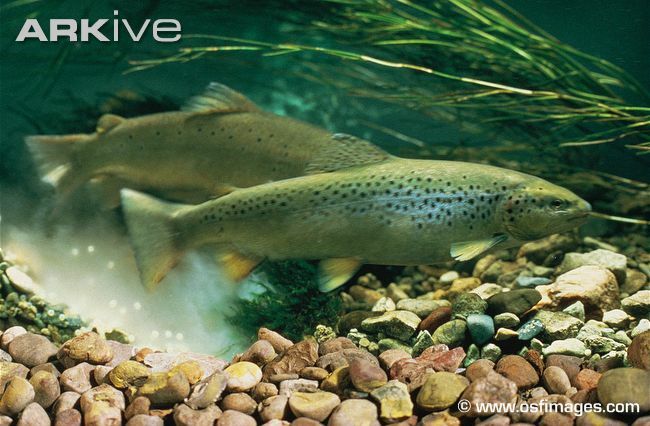 1) Is it "wrong" to C&R fish for brown trout during the spawning season? 2) Do you target browns in the fall (& winter)? 3) If not, why not (besides seasonal regulations)? Well, I certainly fish for bass (strictly C&R) on the spawn, so why not? These are important ethical questions, but let's recall that while we are wringing our hands over such issues, poachers are taking all kinds of fish, all year long, and polluters aren't thinking twice about what impact they have downstream. Both of those things kill waaaaaaaaay more fish than "disturbing browns during spawn." Sometimes we tend to get caught up in our own ethics, in the pursuit of what's right......while the guy downstream is fishing with dynamite or my personal favorite, "ringing up a few lunkers" electrically. I fish for browns in the fall because I love to watch their aggressiveness. But I stay out of the creeks. They are really small where I live anyway. To me fishing a "redd" seems and feels like an unfair advantage. Fishing during the spawn in feeding areas doesn't. I always tell myself to "respect the fish". That goes for treading lightly in their environment to how I play the fish, handle them and release them. If it came down to feeding you and your family... well that changes everything. That's a different discussion though. Good set of questions! First you’d have to consider the water you’re fishing, your location and the species you’re fishing over. Here in Colorado, you have the Browns running in the fall and early winter and the Rainbows running in the spring. Some of the Cutts don’t get into full fledge spawn until late spring and early summer and a high elevations may spawn as late as July. Then you add in the genetically altered fish that we see stocked and you will occasionally have fall spawn rainbows, cuttbows and there’s always the kokane runs to consider. If an angler was to totally respect and protect the fish on their spawning runs, our fishing time here would be very limited. As to C&R for brownies on the spawn… Yes, I think it’s fine to fish for them, just like it’s OK to fish the rainbows or of other species when they’re making their runs. The problems arise in two situations. First you see a ton of photos of big brownies taken on our waters back here where the angler is posed and holding the fish for a grab and grin shot. If the photo is taken quickly and the fish not man handled that’s fine, but all too often I see the photo shoots go on for five minutes or watch as the fish are handled and dropping eggs or milt. The fish will survive being hooked and landed if the angler has any skill at all, but may well not survive the aftermath. The second problem is that anglers as a whole haven’t got any idea what a redd looks like and are as likely to tramp through the redds on their way to “fishy” water as not. Redds are an easy wade. Education probably won’t work, but in a few locations here I’d actually like to see DOW post the redds and make them off limits. Both education and regulating cost money and we all know that isn’t in the cards. So I think it’s OK to fish the spawners, but not to fish to them when they are on their redds. I do however feel its fine to fish the other species that line up down stream to eat the eggs on the drift. As to targeting browns in the fall…. I target browns twelve months out of the year and would far rather take a dozen nice browns in a day versus twice that number of rainbows or cutts. Browns require a little work and you have to respect their behavioral elements to be successful where I need far less dedication to fish rainbow or cutt water. Rainbows get up and dance for you and they’re pretty, the cutts are beautiful, but browns rate special attention and effort. I once had it explained to me that rainbows jump to scream help me and browns head for deep water to roll and say f… y.. I like that attitude! Then you take my thoughts on this and it might not apply at all to different water. The browns that run the tribs. on the great lakes are a whole different story. Out here if I’ve got an angler within 20 yard he’s crowding the hell out of me, but some of the combat fishing back east is shoulder to shoulder. Some stream have a very limited spawning run as far as numbers go, others runs may be heavy enough to not even be dented by the fishing pressure. The answers to the questions are all going to vary with location, how well the angler is educated and mostly by how much common sense they apply in any given situation. If I’ve got a ten pound brown setting on a redd, will I? No! If I take him coming up river he’s fair game, but I’ll see to it he’s released correctly and can still meet up with Ms. Brownie upstream. I bass fish during the spawn, but I'll let you decide what is right for you. And thank you so much for the link. That made my day. I think I print this out, laminate it and use it on the boat. I fish all year long with the same thought do no harm. I don't feel fishing for trout during the spawn does no more harm than any other time of year. As far as protecting the redds, most of the streams I fish are to small to wade, so no harm is done. This years lack of rain will cause more damage, than fishing. Well, let's see - I've fished for browns all 12 months of the year, so I know I've fished for them in their spawning period. But I never targeted particular redds, so no guilt thee. I HAVE, however, targeted individual browns in Lk. Ontario tribs, set up behind salmon and inhaling eggs. on some level, it seems worse than going after them in redds. I take greater care to avoid stepping on / wading thru redds in spawn season, but continue ot enjoy the fisheries. I have to agree with most all of the comments here. Shoot, I love fishing for Brownie's during the fall and early winter seasons. My favorite Brown Trout water close by is a larger river so wading does happen sometimes. However, being aware of where the Redd's are and not causing havoc in the area is a prerequisite for me. However, I do fish for them in the general area. I prefer fishing during the cool of the fall and cold of early winter when water levels are more manageable. Great questions and good feedback from your readers here! Wow. Thanks for all of the comments on this. I thought I'd get a good reaction from this post, but these are all excellent points of view. I'm also glad some of you made the association with spring bass fishing, I had intended on including that as a point of reference, but decided not to for some reason I don't exactly recall. @Swamp - A lot of awful folks out there. Luckily, I don't think any frequent this blog. @Casey - Agreed, the territorial nature is a huge turn on. @Sowbug - Good words to fish by "respect the fish"
@Midgeman - I don't even know where to start. Thanks for such a well thought out and complete answer. @Clif - Though a few of you might get a rise out of that link. @Brk - Can't get enough rain. Finally got a good soaking last night, only need a week or so more of it to get the water levels back to where they should be. @Wolfy - Very good way to look at it. @Mel - Fall is personally my favorite season too. I will be taking my son this Saturday to do some fall trout fishing so it was really nice to see this post. I Can't say specifically for brown trout, as my area doesn't have any, but i definitely fish for cutthroat around the spawn, because thats when the big boys come out. I do my very best to avoid redds during spawning, and i will all ways take extra care when handling and releasing a fish. In my opinion as long as you are putting thought into the protection of the species your going for, then thats fine with me. Personally, I don't...it just feels wrong to me. However I really liked and respect Midgeman's balanced approach...really well thought-out.